World record shattered! 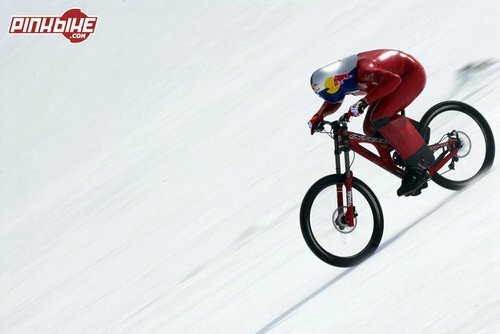 Speed biking on snow at 210 km/h. Austria's Markus Stoeckl, 33, set a new world record at the weekend for series mountain bikes on a renovated high-speed La Parva run in the Chile's Alps when he hit a speed of 210.4 km/h (130.7 mph). He shattered an eight-year-old record by an incredible 23 km/h (14 mph).For years there was little news to report about speedbikes on snow, the world's fastest vehicles without propulsion. In the 1990s, there had been a number of classic, unforgettable duels between two Frenchmen, Eric Baron und Christian Taillefer, who set a series world speed records as they sped down the French Alps clad in rubber suits and aerodynamic helmets with spoilers attached to their bodies while riding on futuristic speeding projectiles that had only a faint resemblance to bicycles. 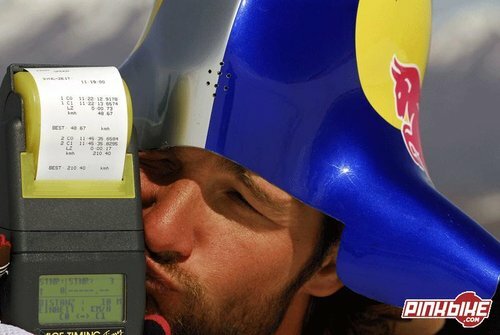 The only other racer who came even close to keeping up with the French duo was a young man from Kitzb-hel, Markus Stoeckl. Because he could not afford an expensive prototype at the time, he rode in the series bike class and managed to set a world record in that category at 187.013 km/h at Les Arches in 1999. Eric Baron's record in the prototype class of 222 km/h had stood since it was set at the same time. After that, interest in France dropped off, as Markus Stoeckl explains: no races, no championships, no runs. Since then, the giant nicknamed "Hercules" (he weighs 100 kg, or 220 pounds, and stands 1.90 metres, or 6 foot 4 inches tall) has taken part in "normal" downhill races, founded his own company, and set up his own World Cup team MS Intense Racing. He was on an assignment in Portugal when he found out that the old speed track in La Parva, Chile was being renovated. He did not hesitate and quickly jumped on a plane to South America after hurriedly packing his old helmet, speedsuit and his new Intense M6 bike. Just seven days later, on Friday, 14 September at 11:18 a.m., Stoeckl was standing at the highest-possible starting point directly beneath the cliffs in front of a 2000 meter long and 45-degree steep slope. The conditions for the record run were far from ideal. Because South America's springtime weather had melted away much of the snow alongside the piste, shrinking it to a narrow strip set up between bare mountain cliffs, it was not possible to gradually raise the starting point for test runs. The final test run took place from a spot that was hundreds of metres below the starting point where a top speed of 178 km/h was recorded. Because the protective visor on his helmet kept fogging over, Stoeckl was also forced to hold his breath for the 40-second run. "I knew that this would be my only chance," he said. The record run went off without a hitch. There were no problems whatsoever and despite hitting a speed of 210.4 km/h it all seemed somehow unspectacular. Markus Stoeckl has now tasted success and he wants to try to break the other age-old records set by Eric Baron, but with better preparation and first-rate material. Fernando Habash, who is in charge of the La Parva ski resort, has promised he would have a course suitable for records set up. "At the end of the run, I had the feeling that I was somehow watching the run myself." "The planning for the trip to Chile was so hurried that I ended up having to use my street shoes for the world record run." Pics by Alfredo Escobar for Sports&News. Brakes look like shimano, i would have gone for 6ti or the Formula One imo. tires look like michelin seeing as the logos are blurred white and not blurred yellow. I've rode 96km on an old swinn 5 years ago, I've drove 236km in a 88 Ford Grand Marq, But 210km on a bike in snow in crazy! That's fast, the winds start doing things at that speed! anyone know if theres a video? I saw one on decline.com.........YouTube has it. but i dont understand how he brake? Really crazy guy! His balls must be as big as the hell and half of Georgia. RESPECT!!! Wow man that is INSANE speed. Mad Props! was he the same guy, on ripleys belive it or not. where he crashed on a voloanco and the bike frame cracked. sick man...ow did he brake? only one thing i dont understand.... last record were 23 km/hr?? i can walk faster. i usually manual that fast.